A large spiral Crop Circle appeared SW of Milan, Italy on the 25th of June. As with the Wiltshire UK circles, the theme this year is planets and alignments. Could these huge Crop Circles in different countries, all be part of an elaborate hoax? Is there really something to note from the familiar messages portrayed in these circles? Poster comments: A couple of days ago I've been informed by Leonardo Dragoni (Cropfiles.it) about the rumours from Italy regarding a new formation in Fabbrico (Reggio Emilia). I asked some friends that live in that area to see what was going on, but nobody was able to help my requests...So I tried with e-mails to flight-schools and aero-clubs, and this evening i received the first positive answer...along with a photo from the sky! 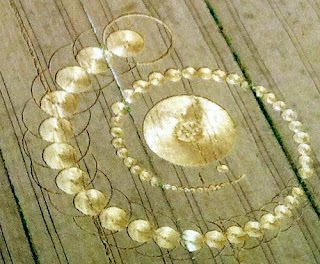 Of course you can use this picture for the Crop Circle Connector database. The only thing I'm asking you is to specify, as a source, "Elicompany.it - Carpi (MO)" Cropcircleconnector.